For 45° ~90° Plastic and aluminum profile cutting. Equipped with cutting angle fine adjustment device. Straight line feeding type; The guide for machine body and feeding system adopt linear bearing system to ensure stable feeding and high cutting precision. Optional: Machine head could adopt air-hydraulic damping cylinder to cut aluminum profile. Same shaft angle-changing structure for good surface cutting performance. Profile supporter is available on the movable head. One time two pieces of profile cutting (height of profile less then 60mm). 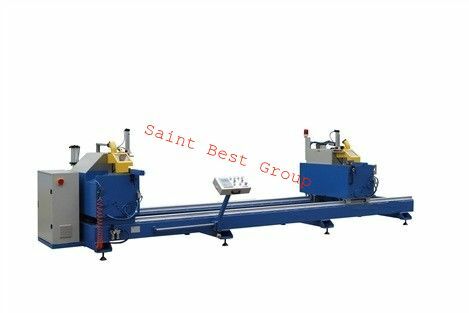 With short profile cutting device on left machine head can realize super short profile cutting.